Blog Can Orchid Air Roots Be Trimmed? It’s really common to see orchids with roots spilling out of their pots and just floating in mid air. Some people love the look of them while others hate them. I’m often asked can orchid air roots be trimmed? Well here is the low down on this common question. 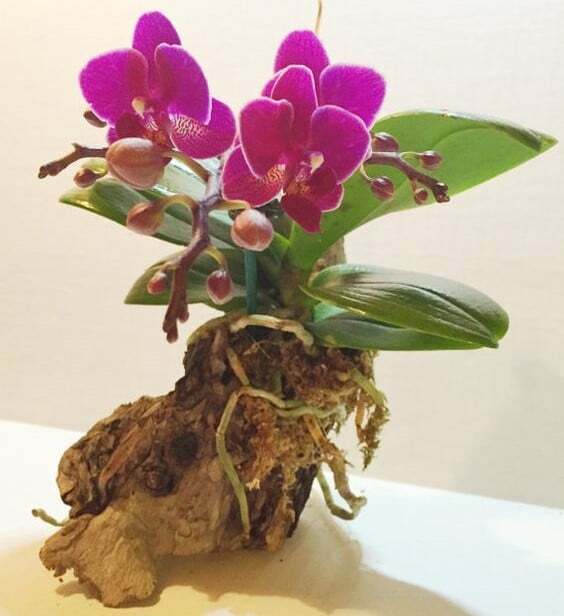 Can orchid air roots be trimmed? Orchid air roots shouldn’t be trimmed as they are part of the system the plant uses to absorb nutrients and water. Trimming the aerial roots could cause the plant to struggle or even die due to disease or inability to absorb sufficient water and nutrients. There are a number of ways to manage aerial roots depending on your preference. Orchid aerial roots are roots which grow outside of the potting media. They can grow from higher up on the stem or can emerge from the potting media. Some orchids will naturally produce many aerial roots, while others will have relatively few. Orchids are naturally epiphytic plants, meaning that they grow on other plants, rather than growing in soil. The roots are responsible for anchoring the plant in position, as well as for absorbing essential water and nutrients. What’s The Difference Between Aerial Roots And Normal Roots? In many ways, aerial roots are exactly the same as normal roots. It is just the location of the roots that is different. There are a few things to bear in mind though. Aerial roots are typically among the healthiest roots on the entire plant, as these roots will be growing in conditions closer to the orchid’s natural habitat. Domestically kept orchids are usually potted in media such as pine bark or sphagnum moss. Over time, this potting media breaks down, and the roots within this media can often be under considerable stress and are at high risk of developing root rot. What Should I Do With Orchid Air Roots? There are a variety of different opinions about the best way to manage orchid air roots. I suppose the short answer and the one which will promote the health of your orchid the best is to leave the orchid air roots alone. Let them grow out of the pot as they wish. Some people love the look of aerial roots spilling out of their orchid pot, while other people find them untidy. If you want to reduce the visual impact of air roots, there are a few things that you can do. This is a popular option, as a lot of orchids are kept in well-draining, transparent pots to improve light to the roots, and then placed in a larger, non-draining decorative pot. When aerial roots emerge, you can encourage them to grow down the sides of the transparent pot and into the decorative pot. This means the air roots should remain happy and healthy, but won’t be on view too much. 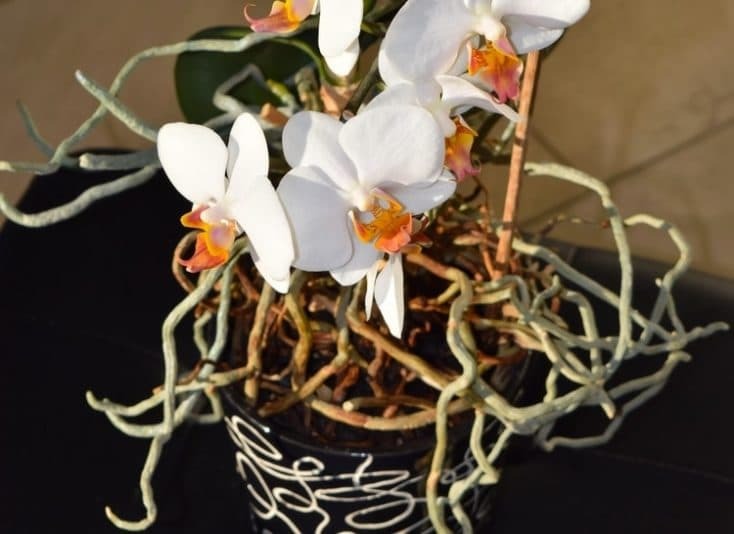 You get the best of both worlds with this option, as the aerial roots are not planted in potting media, which would be unlikely to promote the best health for the orchid, but it also keeps them out of your way. Just be careful that the aerial roots don’t end up sitting in a pool of water at the bottom of the decorative pot. This can easily be avoided by draining your orchid really well after watering to ensure that the decorative pot remains reasonably dry. Whilst many discourage this, as orchid roots are typically less healthy when they are grown in potting media, I think it’s a reasonable option if you really dislike the look of the aerial roots. I’ve tried this technique many times with good success, although it wouldn’t be my first choice management option. I think you need to be aware when doing this though, that there is a chance it will have a negative impact on the health of your orchid. If you are going to try to put all of the aerial roots into a new pot along with potting media, you may wish to consider a potting media that won’t break down over time. Potting your orchid in expanded clay pellets is a good option, as these will provide plenty of air circulation and drainage, which will help the orchid adjust. If you decide to pot the aerial roots, take care to avoid overwatering your orchid. 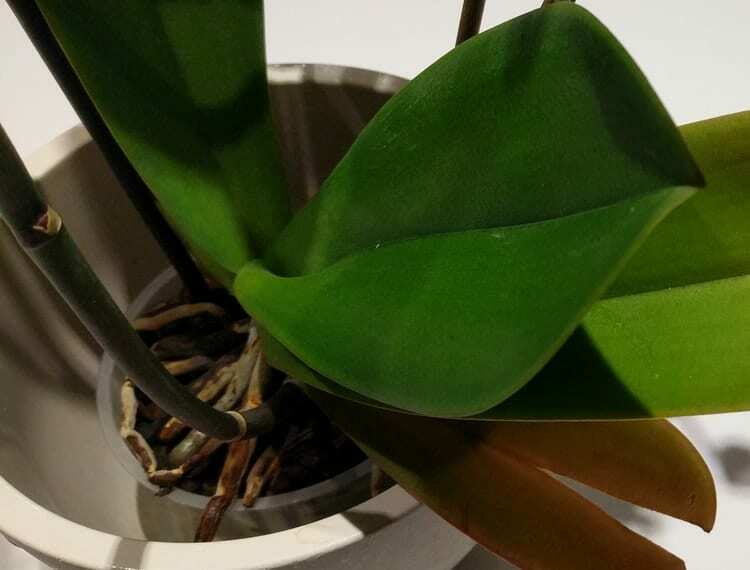 If you continue the same watering cycle as before, the orchid will have more water exposure, due to the increased number of roots getting watered. There will also be residual water that will stay around the roots for longer due them being in a pot surrounded by potting media. If you really just want to be rid of the air roots, can you trim them? Well, I suppose you can as long as you are happy to take the risk of it negatively impacting the health of your orchid. If your orchid only has a few aerial roots and the rest of the plant and roots are healthy, the plant will likely survive without much difficulty. If the plant has copious aerial roots, the plant could really struggle if you remove them, and you should think again. If you do want to remove some aerial roots, try to do this after you have watered the plant, to ensure that it is well hydrated and the air roots are more soft and pliable. Use a sharp blade or fine pruning scissors. Sterilize the blades thoroughly in an alcohol solution or under a flame. The biggest immediate risk to the plant is disease from the open wound, so you need to take care to avoid introducing disease if possible. Cut as close to the stem as possible without danger of damaging the stem of the plant. Cut confidently across the air root, to make the cut as clean as possible. Orchid air roots don’t need much specific care. If you are looking after your orchid well, the air roots will be happy. However, air roots can experience some of the same problems as normal roots, and also some of the problems leaves and stems experience. Do You Need To Water Air Roots? You don’t have to actively water the air roots, but many people choose to spray or water them routinely. If the roots within the potting media are being well supplied with water, the air roots should remain plump, firm, and silvery in color, with green tips. Air roots will gain moisture from humidity in the air. Problems can arise if you keep your orchids in arid conditions. I normally water my orchids by taking them to my kitchen sink and running lukewarm water through the growing media. I ensure the air roots get wet at this time, and normally check the health of the plant generally at this time. During the vegetative phase of orchid growth, I use a weak fertilizer solution every other time I water my orchids. During the flowering phase, I do not fertilize them. 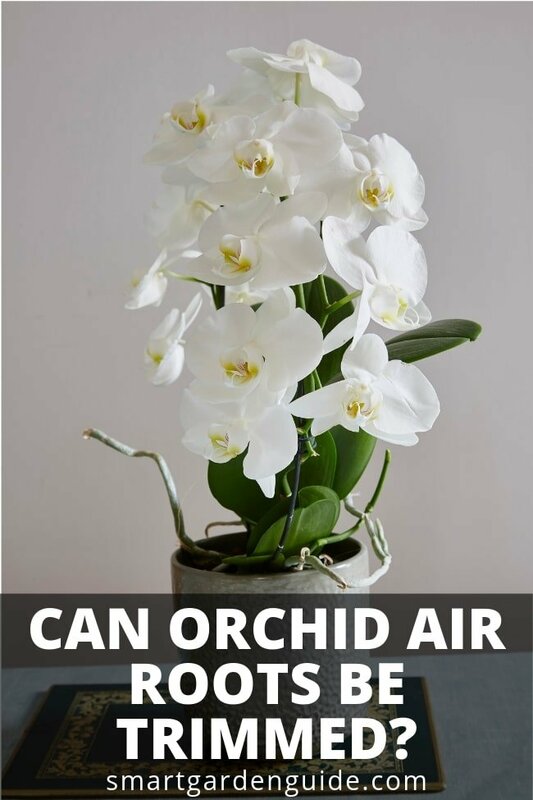 If your orchid has a lot of air roots, it will be more sensitive to humidity levels. Try to keep humidity above 40% so the air roots don’t dry out too quickly. If your house has low humidity levels, consider putting your orchid on a humidity tray or using a home humidifier. Orchid roots are unlike a lot of plants in that they actively photosynthesize through their roots. Orchid roots will usually be dark green when wet and silvery in color when dry. If your orchid roots are exposed to bright, indirect sunlight at the same intensity as the rest of the plant, this will be beneficial to the plant. However, in the same way orchid leaves and flowers can get sunburned, so can orchid roots. If you leave your orchid in hot, direct sunlight for prolonged periods, the roots can become crispy and brown or black. See the picture below for an example of an orchid that was left for months in a south-facing window in the summer. If this happens, the roots won’t recover, but the plant can usually be saved by moving the plant to more suitable light conditions. You may have to prune damaged aerial roots if this happens. Sometimes, rather than aerial roots causing issues, it will be the roots within the potting media. If your orchid pot is crammed full of roots, so much so that they are straining at the pot and rising up out of the media, you should consider repotting your orchid. Orchids generally like to be root bound, so there is a high proportion of roots to potting media. However, there comes a point where the plant and roots will have grown sufficiently that the roots are struggling in the existing pot. At this point, move to a slightly larger pot. Empty all of the potting media out of the pot and free up all of the roots. This is a great opportunity to assess the health of the roots. Remember that healthy roots should be plump and firm to tough. They should be green when wet and silvery in color when wet. If some of your roots are mushy, soft, fragile and brown or black, there is root rot. If the roots are grey, shriveled and crispy, they are dehydrated. Any roots that are not healthy should be removed with sterile pruning scissors and not repotted into the new pot, where they could negatively impact the health of the plant. Make sure to use new potting mix, as the old potting mix, assuming you are using an organic medium, will have started to break down, which will stress the plant and increase the risk of root disease. Can You Mount Orchids Instead Of Growing Them In A Pot? As previously mentioned, orchids don’t grow in potting media in the wild. It is entirely possible, and will often be healthier for an orchid to grow it mounted on a tree, branch or artificial structure, rather than planting it in a pot. Most orchids are sold in pots as it is the conventional way of doing things, and in the short term, is more forgiving to imperfect care. It’s a bit more work to look after a mounted orchid, but you can produce a stunning display. If you’re interested in learning more about orchid care, I have plenty of other articles that you might find useful. I have a particular interest in phalaenopsis orchids and have loads of useful information on the orchid section of this website. I also have a free phalaenopsis orchid care ebook that I am giving away to everyone who signs up for the Smart Garden Guide Newsletter. Very interesting-you can always learn something.